When I graduated from the Anglia Ruskin University in Cambridge in 2001, next on my planned life path was a Master’s degree in Translation. Due to family and financial reasons that wasn’t viable right then, so I returned to Crete and found work in the hotel industry as a sales and marketing assistant for a chain of 3 5-star resorts in Elounda. I had also sent my CV to a few translation agencies and potential direct clients before I left the UK so translation work came right away in the form of 3 books of speeches from political conferences and I ended up doing two jobs; 8-9 hours in the office then another 8 in the hotel room, 6 days a week. After 1.5 years, I had enough of living in a hotel room away from my family, so I returned to Heraklion and found work as a sales assistant in a travel agency. That job was much easier and less time-consuming, so it gave me the chance to do extensive research online, read and learn more about translation, sign up in translation portals (like Proz), send my CV to any potential translation client I could think of: Greek translation agencies, professional associations, hotels and travel agencies etc. To cover the individuals and the businesses I didn’t contact directly, I put an ad in local newspapers. That ensured a steady flow of translation work until I was ready to move to Athens where my next step was to work in-house in a translation agency in order to learn to use CAT tools. That came true but I only stayed there for 1.5 months. I was very active sending CVs and applying for freelance work even before I arrived in Athens, so my constantly growing freelance work allowed me to leave the agency and work full-time from home. Weirdly enough, I didn’t cooperate with translation agencies in Greece. The very few that replied to me and sent tests, never sent any feedback or work. When some of them finally decided to contact me a few years later, I was already too busy with work from agencies abroad at much higher rates, so I never got the chance to work with Greek agencies. About a year later, in the summer of 2005, I figured I finally had enough experience under my belt to start sending my CV to translation agencies abroad. I did that regularly (about 50 CVs each week) for the next year or so. I was fortunate enough to start getting work right away and haven’t been without work since. For the next 4 years I didn’t do much else than translate 12-14 hours daily. In the meantime, I got married, moved to a new house and since hubby is also a translator, we combined work and family time to full translation mode. Catherine Christaki has been a full-time freelance translator since 2001 and co-owner of Lingua Greca Translations since March 2012. 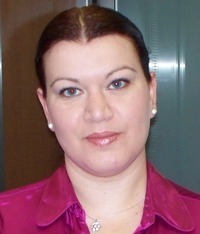 She translates from English, French and German to Greek and specializes in IT, Medical and Gambling texts. She is happily active in social media (especially Twitter, @LinguaGreca) and co-writes a blog called Adventures in Freelance Translation.